Summers here, let's get active! Big or small, young or old, dogs need to exercise daily. While some breeds have special needs that have to be taken into account, and dogs do slow down as they age, they still need to take part in some form of daily physical activity. Exercise helps the body and metabolic system to function properly and engages the mind. Dogs, particularly puppies and young dogs, have a lot of energy, and if they don’t get the chance to burn it off, destructive behaviour is often the result. Exercise needs are based on a dog’s age, breed, size and overall health, pay attention to your dog's signals. If they are restless or pacing, they are probably itching to get out for a nice long walk. If on the other hand, your dog is content to just lie around, there may not be such a great need for exercise. A short walk will be enough to keep everything in order. Dogs that are less active or older may have conditions that are slowing them down. Whether it is because of too much weight, achy joints, and muscles, or they just like to mellow out most of the time, they still need some activity to keep the body working as it should. 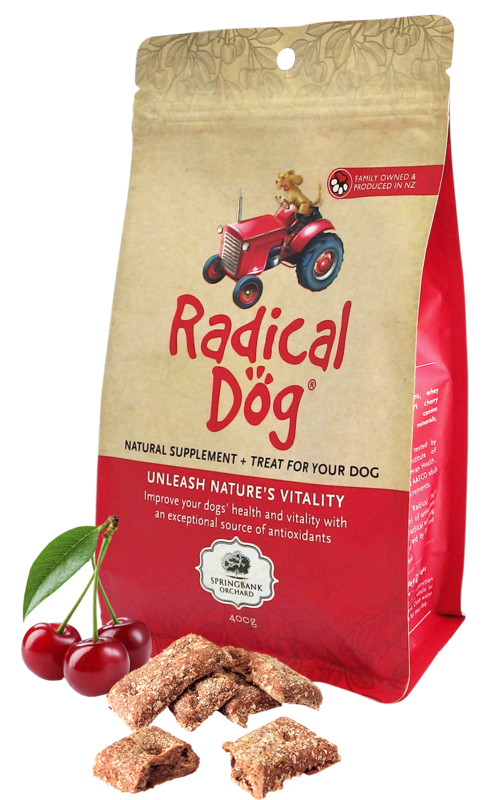 Radical Dog biscuits will help give them a new lease of life if they fall into this category! From the little Cairn to the larger Airedale, these dogs are generally bouncy and charismatic pooches. Although they have significant exercise requirements, these dogs are smaller than the herding and sporting members and can get a fair amount of daily exercise around the yard. But they should get a minimum of 60-minutes exercise daily. This is a very diverse group that encompasses the sight hounds and scent hounds. Sighthounds like Greyhounds may have lower exercise needs, they are sprinters that release energy in quick bursts. Allow them a couple of harder sprint workouts per week. Scent hounds have higher exercise needs, similar to the herding and sporting dogs. If you have any concerns about whether your dog can handle a long walk or whether you should implement an exercise plan, talk to your veterinarian. Your veterinarian can do a health check and recommend an exercises plan that is appropriate for your dog's age, breed and condition You don’t want to pressure your dog into doing things that are too strenuous or you could end up with bigger problems. Start slow if your dog has not been accustomed to being physically active, and observe their response, adding more activities or more mileage as she gets stronger. Your dog should be happily tired, not exhausted when you are done exercising for the day.